Megiddo is one of the most important sites for the archeology of the Israelite kingdom, but there also many secrets to divulge as scientists struggle with the correct dating of the finds. Its site, in the flat and broad Jezreel valley in northern Israel, witnessed many battle scenes. As so many powerful cities in the region, its history starts under the Egyptians, who ruled its Canaanite inhabitants. Megiddo's location was fortunate, connected to the ancient trade route to Egypt and Mesopotamia which ran along the sea by way of a pass through the Carmel mountains. By the year 3000 BCE it was already a fortified city. Its name occurred for the first time on the temple reliefs in Karnak, Egypt, where Pharaoh Thutmose III recorded his triumphant campaigns in the Levant for posterity. In 1468 BCE, so we read, while on campaign to subdue mutiny in the Canaanite city-states of Israel, he surprised their armies who lay assembled unaware in Megiddo. The proud inscription features the pharaoh arriving in front of the walls in a golden chariot. It was to be the start of a siege of seven months. After the capture of the city it appeared that Megiddo also had their own share of gold-worked chariots: two of these items appear in the list of booty that the Egyptians carried off. Besides these, the conquerors looted another 892 chariots, two thousand horses, and heaps of armory. 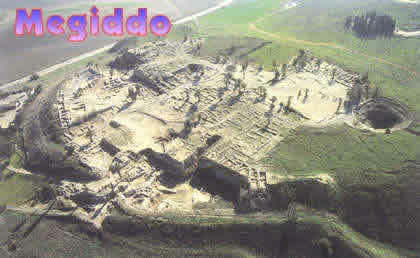 After its capture, Megiddo was ruled for about a century by a vassal king who was controlled by Egypt. This we know from Egyptian documents called the Amarna letters. The city prospered at this time and traded as far as the Hittite empire, as is witnessed by the finds of many artful imported gold and ivory objects as well as jewelry. During the time of the Judges, Megiddo eluded the warfare of the Israelites (Judges 1:27), apparently despite the message in the song of Deborah in Judges 5 which speaks of a victory over the Canaanite kings near Megiddo. At a later stage it did become an Israelite city; maybe it was conquered by King David. It became of the main cities in the united monarchy. Solomon built a double wall on the summit of the city and built many public buildings (I Kings 9:15). But five years after Solomon's death it was razed by Pharaoh Shishak's campaign of 923 BE, as becomes clear from inscriptions on a victory stele (a pillar with inscriptions on it) that was found in Megiddo (see also I Kings 14:25-26). Despite the destruction it became once again one of the important cities in the Israelite kingdom, and especially so during the reign of the Northern Israeli Kingdoms, Kings Omri and his son Ahab during the 9th century BCE. These kings restored the city to its former splendor and more. They were also militarily strong and succeeded to ward off the Assyrian power, at least temporarily. But in 733 BCE Megiddo could not hold them back anymore. The Assyrian army under command of Tiglath Pileser III invaded and destroyed the city and, after renovations, made it their capital of the Jezreel valley (II Kings 15: 29). From here the Northern Israelites were led away to exile to other countries. The original inhabitants never returned. In 609 BCE King Josiah assembled his army in an effort to hold back Pharaoh Necho of Egypt from helping the crumbling Assyrian army fight the new force in the region, the Babylonians (II Kings 23:29-30). But as soon as he arrived in Megiddo, Necho killed him. Not long after Megiddo dwindled down for unknown reasons into a village with a small fort. In the 4th century BCE it was entirely abandoned. In the First World War the overgrown tel was the scene of a battle between the Turks who used it as a lookout, but they were surprised - like the Canaanites before them were suprised by Thutmose III a millennia earlier - when general Allenby approached through the Arun pass in the Jezreel valley. Allenby later added 'of Megiddo' to his family name. At the entrance to the park there is a model of the site, which shows the city at the time of Omri and Ahab. All in all there are 20 layers superimposed upon another, representing 30 different cities. The site is still being excavated but in recently activities have been interrupted for security reasons. Meanwhile a debate is raging, already for some years, between archeologists over the correct dating of the finds from the united Israelite monarchy in Megiddo. There are assorted finds of this period on the tel and it is widely believed that King Solomon built on it, which is also mentioned in the Bible. The current excavator Israel Finkelstein wants to include more buildings and corresponding artifacts that were found in them to the later divided monarchy, after the death of Solomon. He thinks that at least part of the so-called Solomonic buildings were actually built by Omri and Ahab. Recent C-14 checks have indicated that this seems to be true. The description here follows the accepted view. The entrance to the city is through the gates. There are remains of several period gates, ranging from Canaanite times to the 7th century BCE. From the reception one enters via the Solomonic gate, first going up on a ramp. On the right are steps that were used by pedestrians. In front of the first gate (in the middle of the ramp) steps lead down to an early water system from before the time of Solomon. The wall on the right is also from this early time. At the end of the ramp there is a junction. On the opposite, is the Solomonic inner gate. This has the familiar feature of three guardrooms on either side of the gate, like in Hazor. The excavators dug out only the right side of the gatehouse, but the opposite side was its reverse (so there were six guardrooms in all). On the left is a pier that belongs to the 7th century BCE, in which the ground level was raised. On the left, outside of the ramp, lies a building from the Canaanite 16th century BCE. On the right is the corresponding gate from the same period. This had already the same form as the Solomonic gate; in order to enter the city one had to make a right turn. Probably this was meant as a precaution against hostile elements entering the city: the shield was carried on the left, so in turning right the vulnerable right side of the body was exposed. This Canaanite gate, with inner and outer gate, was made of stone. More to the right, where the ramp ends, there is an even older gate, dated to the 18th century BCE. This one is built of mud-bricks on a stone base. The newer gate was presumably built to allow the passing of chariots. 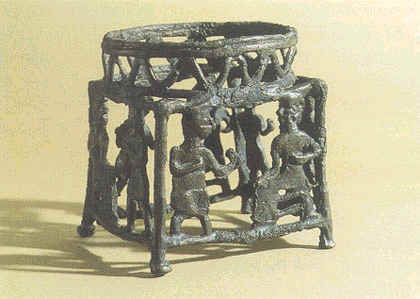 Between the two Canaanite gates a Bronze Age palace was excavated, which yielded a hoard of carved ivories and jewelry. 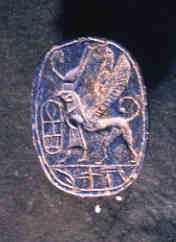 One ivory seal shows a depiction of a griffin, a fable animal, half eagle and its lower part a lion, wearing an Egyptian pharaoh crown; with an ankh, symbol of the Sun God. Other ivory objects were jewelry and cosmetic containers and ornamental furniture. The influences of the artwork are Egyptian, Hittite, Aegean and local. Solomon's palace is on a promontory. It measures 21 by 28 meters. Its five northern rooms, bordering a courtyard, were incorporated into the double wall with which he fortified the city. Next to it, on the other side of the street, is another Solomonic building. There are four cult temples here. The oldest one dates to 5000 years ago and lies to the east. Its structure is simple: one long room with an altar opposite the door, and an outside courtyard. A newer temple, with a large round stone altar, dates to about 500 years later. It was then connected to a two-room temple. The first room was a pillared vestibule, the second is the main worship area with the altar. Under this temple was another monumental building, apparently belonging to the first, older temple. Its corridors were chock-full with sacrificial animal bones. The other two temples to the west are from the same period. At some point they went out of use, and it is not known what happened after that, nor were traces found of worship in later, Israelite times. The city was fed by grain which was kept in a large silo. Next to it is a large structure which is dated to the time of Omri and Ahab, and is probably a large storehouse. But other scientists say these were stables or hangars for Ahab's 2000 chariots and 10000 infantry (probably inflated numbers). There are storehouses in other parts of the city too; under one of them is another palace of dressed stones, which could date to the time of Solomon. Water was hauled from an elaborate water system, similar to the one in Hazor. It was built by either Omri or Ahab and has a shaft 30 m deep, followed by a tunnel leading to the spring of 70 m long. The tunnel was dug out in the rock in the same way as Hezekiah's tunnel in Jerusalem: diggers started at the two ends and worked towards each other. They operated by ear, but at one point they realized that they were heading wrong, and they started digging in another direction. The exit of the cave with the spring was camouflaged by a wall and a layer of earth. Visitors can go inside the tunnel.